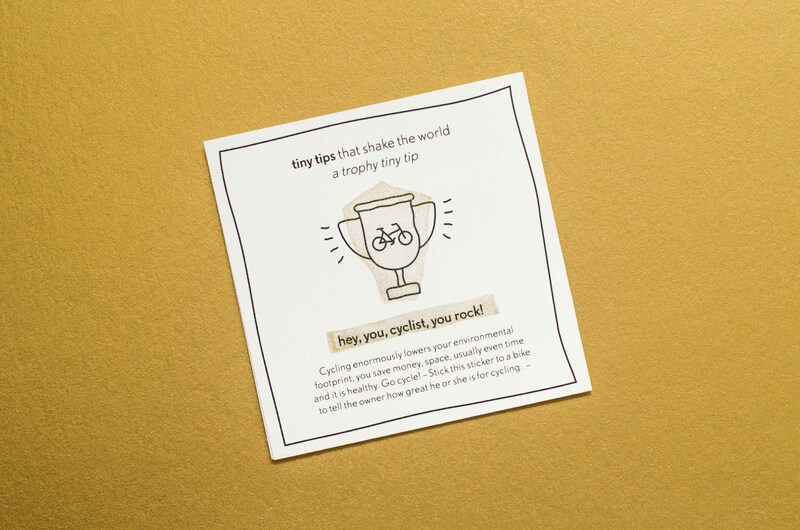 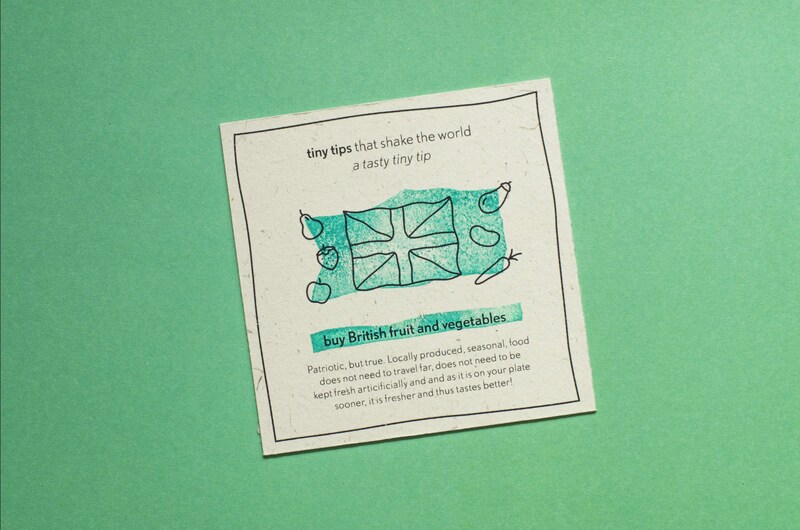 Tiny tips that shake the world is an inspirational campaign – both online and offline – that, in a positive, humouristic and encouraging way aims to inspire, motivate and engage people to live a more sustainable life by offering small things – tiny tips – that people can do to live a more sustainable life. 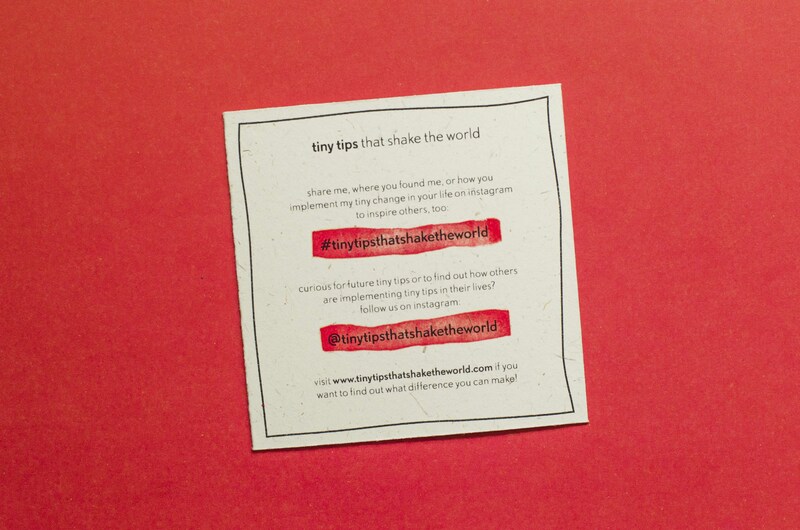 Tiny tips that shake the world shows people what they can do, how they can do it, how pleasurable and easy that is and it creates a sense of community and thus reciprocity. 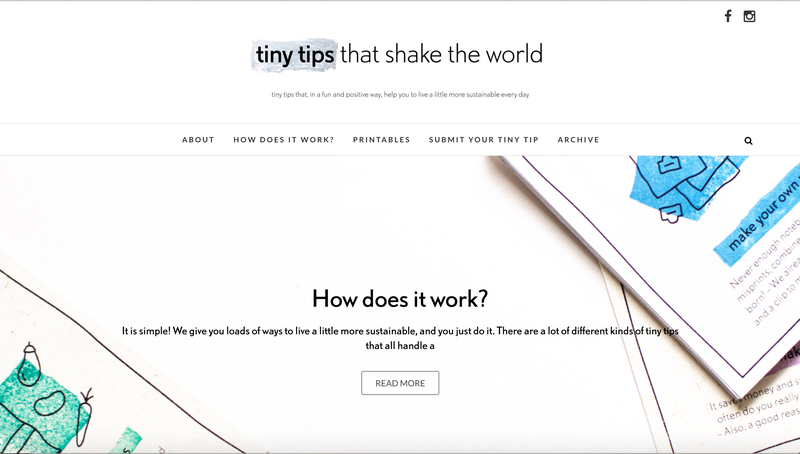 Tiny tips that shake the world is based on extensive primary and secondary research and aims to answer the following question: How might a sustainable life be made more easily accessible and appealing to people who do not particularly care about sustainability, in order to inspire, motivate and engage them to live a more sustainable life? 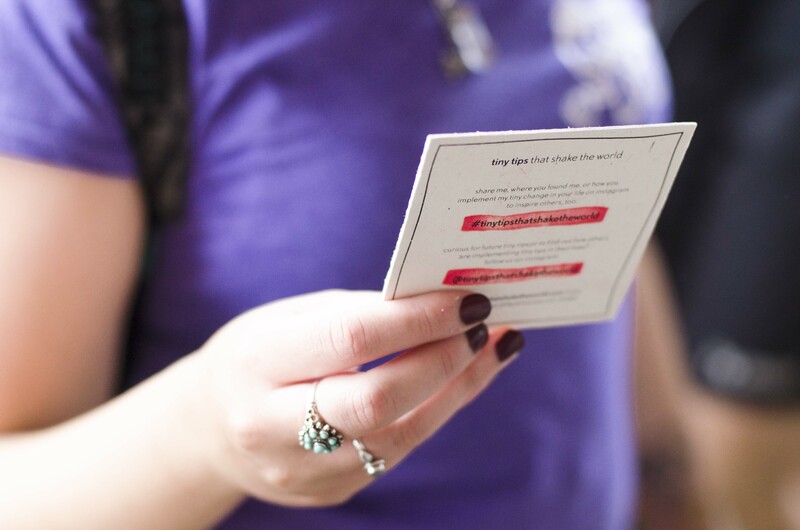 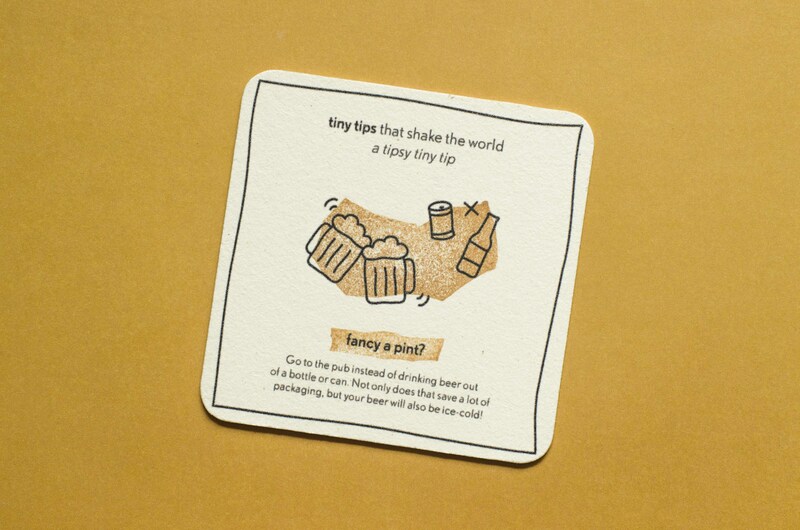 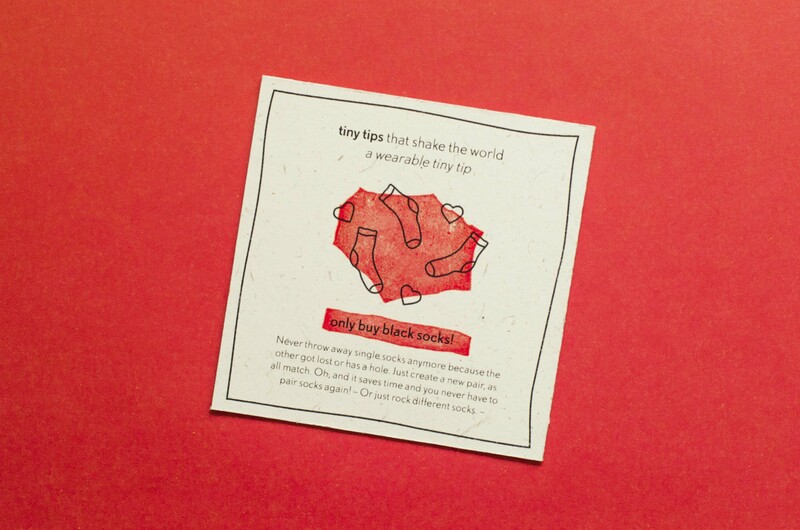 The tangible tiny tips cards – Those can be found in public area’s. 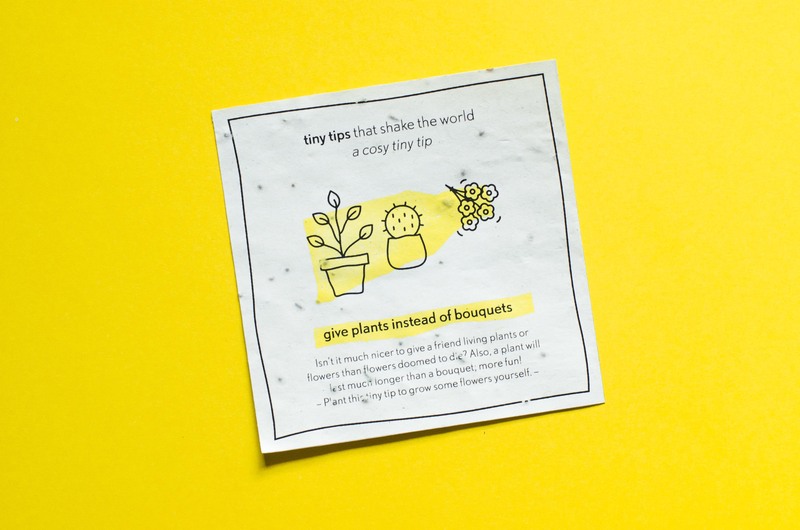 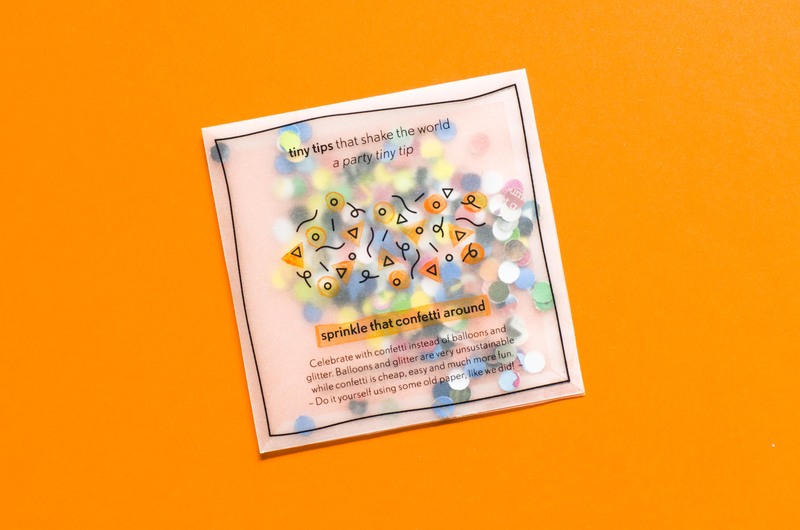 What makes the tiny tips special is that most of them come in a form that suits them; They are not just cards, but coasters, stickers, notepads, seeds, confetti pouches and many other forms. 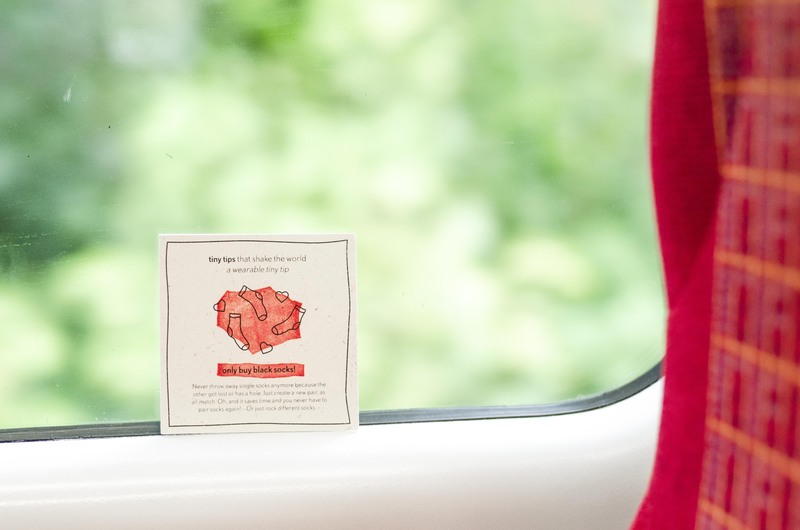 If they are cards, they are printed on paper made up of 25% elephant poo and 75% British paper waste. 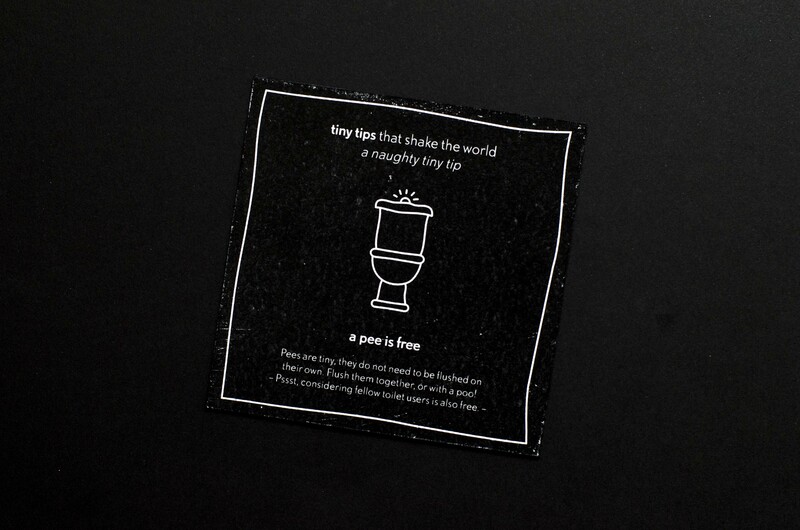 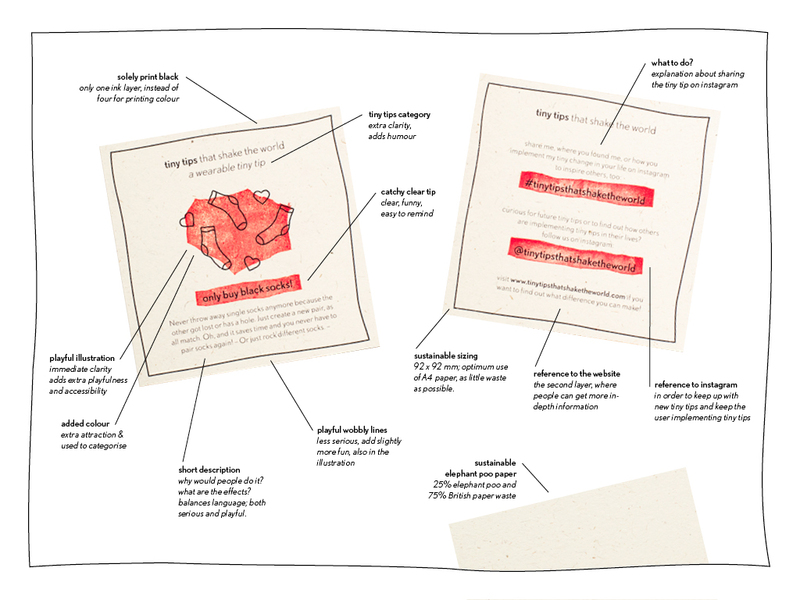 The cards are as sustainable as possible, by their paper, but also by their single layer of ink by only printing in black, and the format that ensures minimum paper waste. 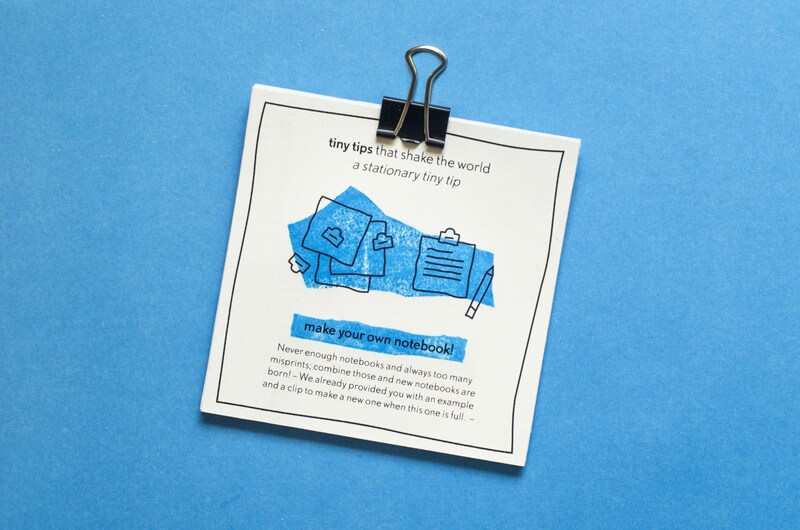 The website – Online people can find background information; the effects of doing the tiny tips, printables, an archive and the opportunity to send in their own tiny tips. 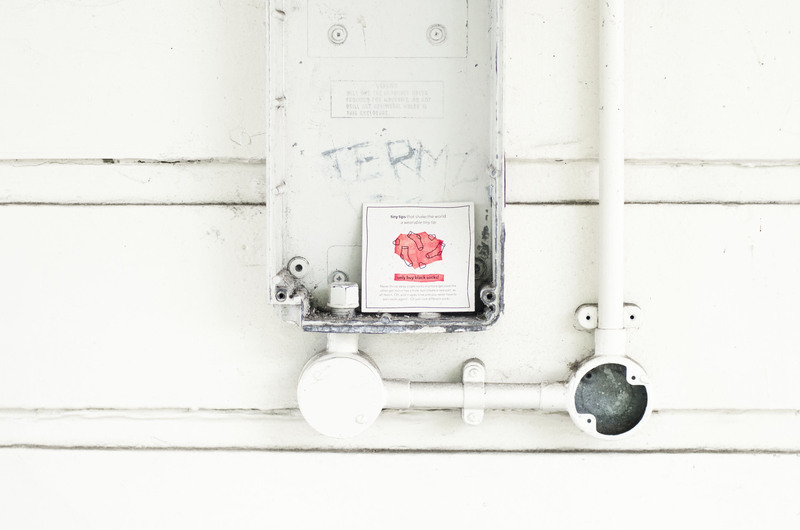 Instagram – Instagram functions as the metaphorical clubhouse; This is where all information comes together, where experiences are shared and where the sense of community is created through the reciprocity that Instagram offers. 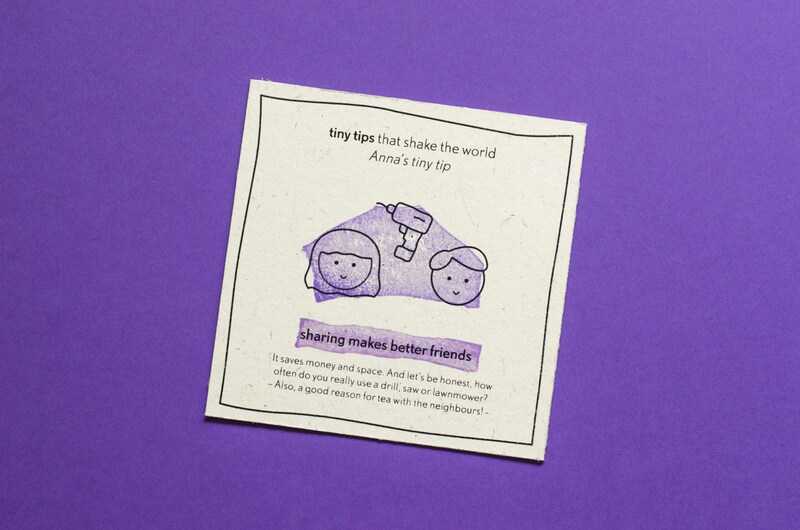 Facebook functions similar, but Instagram remains the main platform in the case of Tiny tips that shake the world. 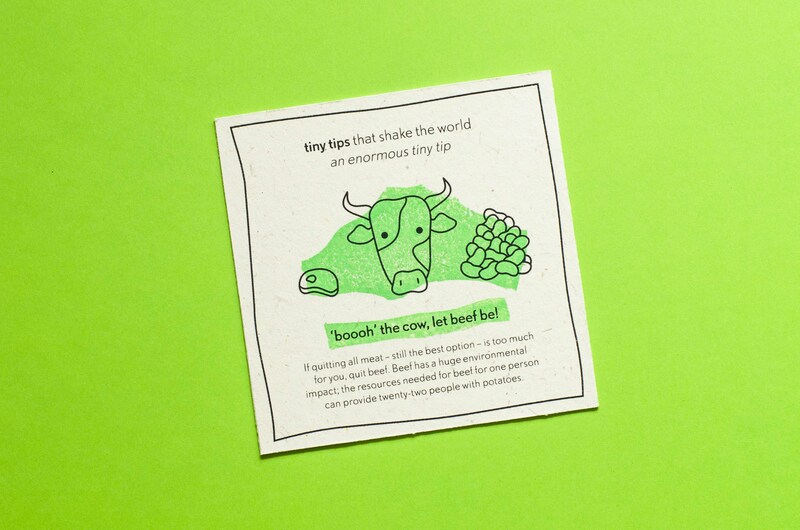 There are a lot of different kinds of tiny tips that all handle a different aspect of life; tasty tiny tips, wearable tiny tips, thrifty tiny tips, party tiny tips, tipsy tiny tips, sporty tiny tips, together tiny tips, masculine tiny tips, kids tiny tips, cosy tiny tips, guerrilla tiny tips and even naughty tiny tips, enormous tiny tips and tips that are send in by the audience.